Each section below has a few screenshots to give you an idea of Sweep's capabilities. Click on the pictures to see more about each topic. 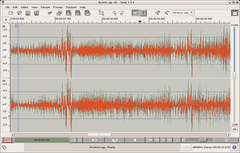 Sweep is a very interactive sound editor which makes heavy use of audio feedback to make your tasks of manually analysing and editing sounds easier. Of course these screenshots cannot capture the interactivity -- you will have to try Sweep out for yourself to experience that. These screenshots show the most common editing windows and dialogs that you will encounter. 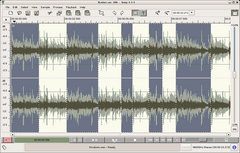 This section introduces Sweep's main waveform view, extended selections and edit history. Sweep supports many file types, including PCM (WAV, AIFF etc. 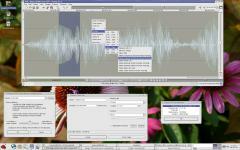 ), voice formats including Speex, and the Ogg Vorbis perceptual audio codec. This section displays the options available for loading and saving various different file types, and for creating new files. There are over 70 effects plugins freely available for the LADSPA plugin standard, supported by Sweep. This section of the tour provides more information about these, and gives some example screenshots. 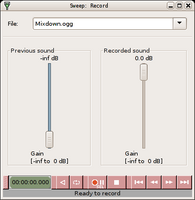 Sweep provides intuitive controls for playback latency and recording. Sweep is used in a wide variety of environments. These screenshots are contributed by users to show some of the different styles and desktop themes available. To finish off the tour, here is a gallery of the various colour schemes available for Sweep's waveform displays.